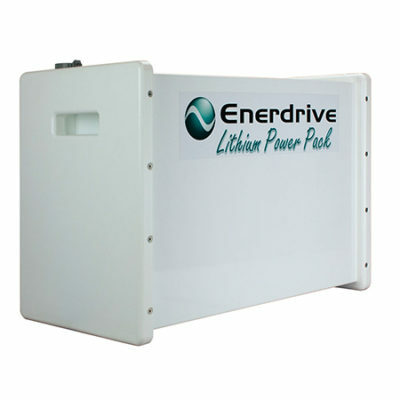 To Suit Enerdrive Lithium Power Pack Batteries, available in 100Ah, 200Ah, 300Ah, 400Ah & 500Ah capacities. The Installation Kits suit the Power Pack Series Battery Only and are sold as part of complete system setup. Please contact Enerdrive for more details. 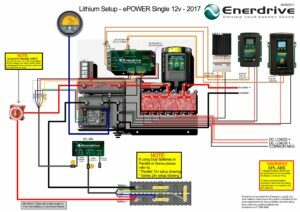 Enerdrive has a complete lithium battery and installation solution to suit nearly every application. Enerdrive Lithium Ion Installation Kit Mounted on a Aluminium Power Coated Plate. Enerdrive have designed and created a COMPLETE Battery & Installation System so your Li-ion battery bank is fully protected and designed to give maximum performance and longevity. 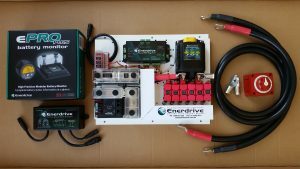 So what’s so advanced about our Enerdrive Advance BMS Relay Driver? 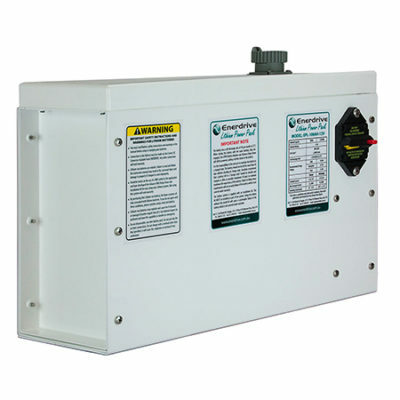 System Program Selection Switch: The Enerdrive Advanced BMS Relay Driver has 2 pre-programed settings . 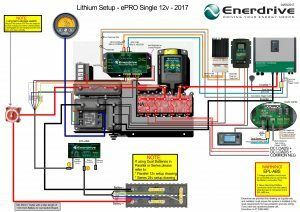 Standard Program; This program isolates the charging sources (solar/vehicle/mains charger) in the event of a battery cell voltage being too high without turning the whole electrical system off. The Enerdrive Advanced BMS Relay Driver will activate the output contact that will cut out all charging sources for 10 minutes. If the cell has not come back within range before 10 minutes, it will stay active for another 10 minutes and repeat until the cell/s are within range. This setup allows the system loads to still be powered. In the event of low SOC%, the main battery relay will disengage to protect the battery. All charging sources (solar/vehicle/mains charger) will still be active to recharge the battery providing the sun is up or the chargers are plugged in..
Combi Program; This program is used when the system incorporates the ePRO Combi Inverter/Charger.it works very similar to the standard program but is modified to for the combi’s unique features and benefits. Active Cell Balancing; The Enerdrive Lithium battery packs incorporate Active Cell Balancing across the range. The balancing method used is Dynamic Energy Transfer. This allows for automatic balancing of the cells during charging, discharging and storage. Any cells with high voltage density will transfer energy to the lower cells in the pack. This method of cell balancing utilises the energy within the battery pack to balance the cells unlike passive balancing systems which bleed this excess energy off as heat to keep the battery balanced at the top end of the charging cycle, wasting energy already stored within the battery. Low State of charge (SOC%) Relay Cut Out: The system is designed to disconnect the battery if it has been drained to a pre-set capacity. When the monitor registers the low SOC% or voltage set point, it will disengage the Enerdrive Latching Relay to prevent further discharge and/or damage to the battery. 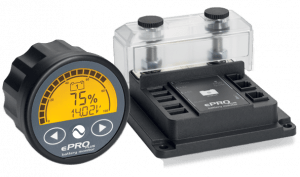 The ePRO PLUS Battery Monitor is supplied as part of the installation kit and is pre-programmed by Enerdrive with all of the alarm set points to match the specific installation. The meter will show all of the relative information like Volts, Amps, Amp-hours, Percentage State of Charge & Time to go. It will also record all of the history data of the Lithium Ion, Deepest Discharge, Battery Cycles, Hi/Low Voltage & Amps, All Alarm History Etc. This is a critical part of the Lithium Ion installation kit and a must have for any battery system.